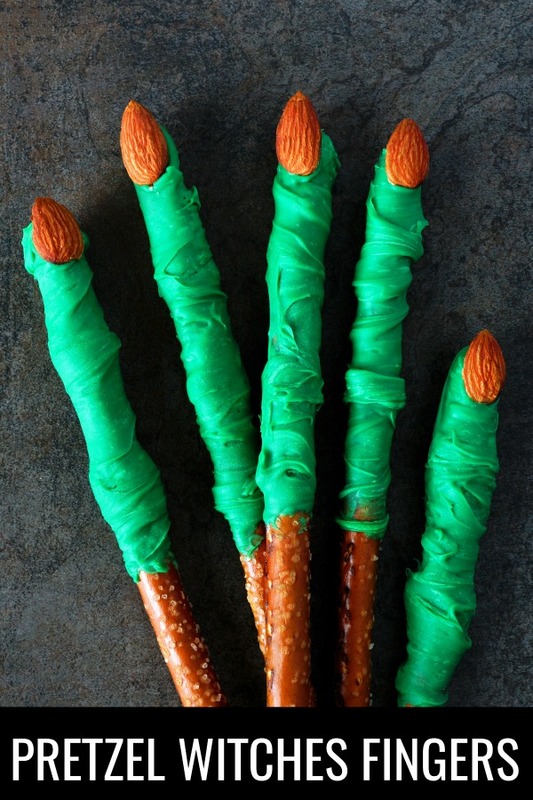 This dipped Halloween pretzels witches fingers recipe is so easy to make and perfect for a dessert or party. These witches fingers are the right balance between a salty and sweet snack and come together in minutes! If you want an easy Halloween dessert that’s homemade and a crowd pleaser, you’ll want to try these Halloween pretzel rods! Y’all know how much I love me some easy recipes. And if you’ve been following my blog for a while, you also know I’m addicted to making holiday pretzel treats. Well with Halloween right around the corner, I couldn’t resist trying my hand at some witches fingers! These things are slightly spooky, but still, kid-friendly enough you could bring them as a Halloween snack for school. There are a few different ways that you can do this. It’s all based on how much time you want to spend on it and the end look you’re going for. You can use whole almonds as I did in this recipe, you could use sliced almonds so the nails are thinner, or you could blanch the almonds and paint them black with gel food coloring. Blanching and painting would take too much time for me when I’m looking for an easy recipe. A simple way to add a little more detail and a spookier look is to add a fix the almonds onto these Halloween fingers with red candy melts so it looks like blood. 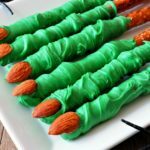 This dipped Halloween pretzels witches fingers recipe is so easy to make and perfect for a dessert or party. These witches fingers are the right balance between a salty and sweet snack and come together in minutes! If you want an easy Halloween dessert that's homemade and a crowd pleaser, you'll want to try these Halloween pretzel rods! Heat green candy melts in the microwave according to package instructions. Dip pretzels into green candy melts. Twist to coat and shake slightly to remove excess before laying on a baking sheet. 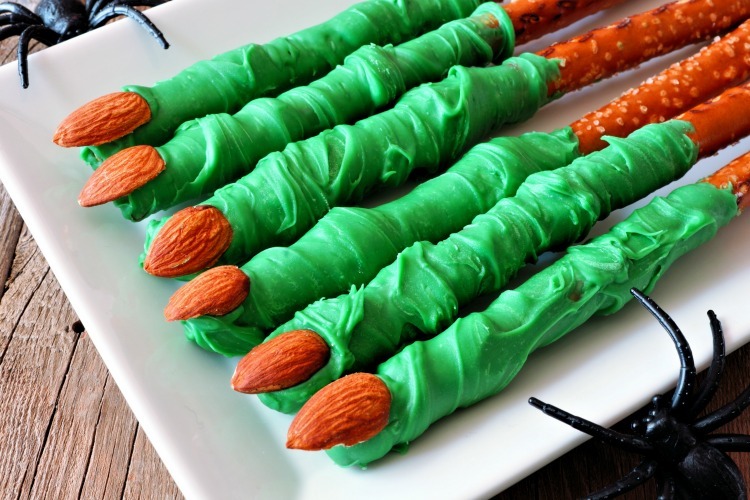 When all pretzel rods are covered, add almonds to end of fingers to create the witches fingernails. Optional: To create more detail, you can also freeze the witches fingers to set the candy and then create knuckle details with a toothpick. Have you made a witches fingers recipe before? If you have tips, share them with me on Facebook! 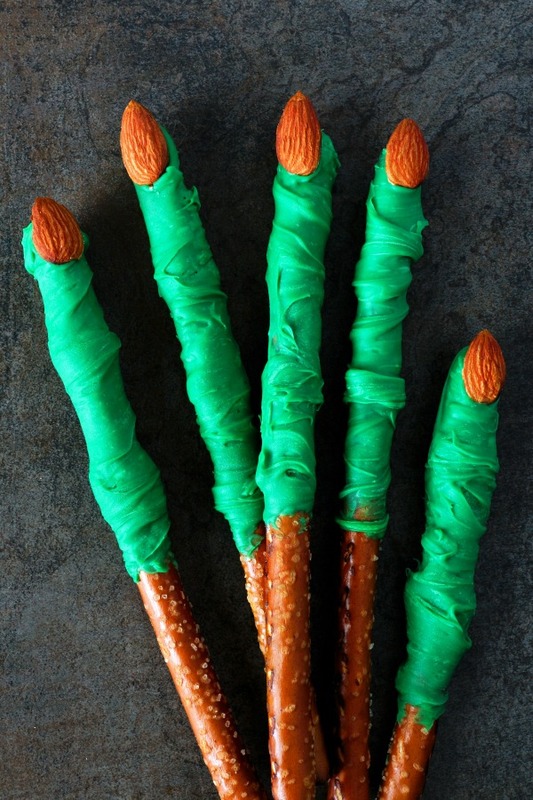 Pin these Pretzel Witch Fingers for later!